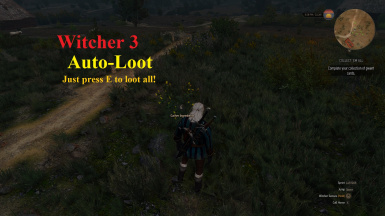 AutoLoots eliminates the tedious loot interface and helps you by automatically looting the items you set it to loot! Feel free to redistribute or modify my mod. CD Projekt Red for an AWESOME game and for ModKit. Fixed all Radius Loot bugs. Fixed treasure chests looting bugs. Fixed a bug with looting Gwent cards. Fixed a bug with looting treasure chests. Fixed a bug with looting blueprints / recipes. 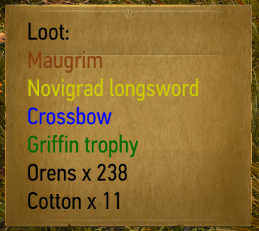 Fixed a bug with looting quest items. Made text more readable when looting magic items. Doesn't apply to Herbs version, it's already readable. Remove debug message being showed during gameplay. Only affects No Acc. Stealing version. Slimmed down the memory usage and CPU usage. Fixes radius loot, might reduce performance. Fixed issues with radius looting. Rebuilt mod from ground up. Fixed as many bugs as possible. Adds a AutoLootPrepAndRebalance() function to scale items to player level. Double checks if container is a quest container. Fixes a bug with radius looting only one container at time. Fixes a bug with quest containers. Adds an option to disable looting sound. Fixes treasure hunt containers not deactivating the map pin on looting. Improved loot in radius compatibility. Single item at once radius looting now working properly. Improves the way AutoLoot on death works. Fixed the maximum items at once not working bug. Fixed a bug when it wouldn't autoloot food. Fixes a bug with the loot sound playing when it shouldn't. Fixes a bug with an empty Loot: notification. Moved all mod functions under the AutoLootUserConfig class and its extension AutoLootMod class. Now properly cleans up after itself when looting. Begins work on moving to a new mod system (instantiating, constructing and deleting the mod class). Autoloots more than 1 container simultaneously. Includes all fixes up to standard version 1.3.2. Adds more custom options to the loot in radius feature. Improves performance by doing less useless checks. Fixes notifications for loot in radius feature. Adds an AutoLoot in radius feature. Another try at fixing the Ciri crash. Fixed a bug when game would crash while playing as Ciri. Fixed a bug when game would crash while looting forktail. Added a better notification system with item quality and quantity, code suggested by user mcguffin. Fixed loud sounds when autolooting multiple items. Removes the need for different version by introducing customizable filters. 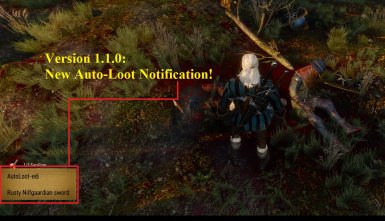 Adds customizable options for: notification on/off, notification duration, dead bodies loot. Small mistake in 1.2.4 prevented compilation. Finally fix the dead bodies with quest items bug. Fixed a bug when AutoLoot would break quests. Fixed a bug when the mod auto-looted any dead bodies. Now it only autoloots bodies of NPCs killed by the player. Fixed a bug when the loot popup would appear in combat. Improved performance by moving the AutoLoot hook location. Improved compatibility by adding a new function to the hook. Added a new Notification system. Fixed an issue when the mouse cursor wouldn't appear when it was supposed to. 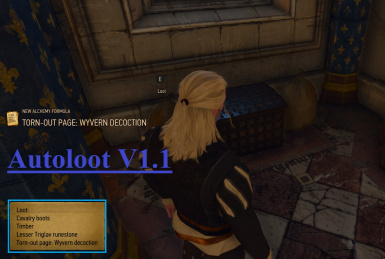 This mod does its best to eliminate the tedious loot popup. Using customizable filters you can automatically loot whatever you want from containers, or manually loot things you might not want. Check out AeroHD's Configurable All-In-One version of this mod, which has been updated more recently, and contains an in-game configuration menu / some new features. Compatible with the latest Witcher 3 patch! Check this thread on info on how to customize filters! 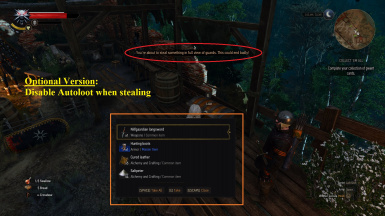 No Accidental Stealing: does not auto-steal. 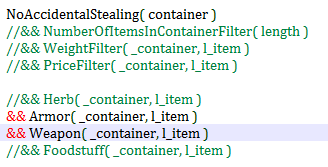 Containers with only X items in them: use this filter to loot containers with X items in them, or less than/more than X items in them. Weight Filter: use this item filter to autoloot items of a certain weight. Herbs Filter: auto loots herbs (ingredients). Armors Filter: auto loots armors. Weapons Filter: auto loots weapons. Oils filter: auto loots oils. Foodstuff filter: auto loots food and drinks. 1. Download the version you want. 3. Start the game and wait for the scripts to compile. Open the Documents > Witcher 3 > input.settings file. also add the same thing under the [Swimming] and under the [Horse] category. You can also add it under the [Exploration_Replacer_Ciri] or under the [Diving] section if you want radius loot to work as Ciri or when diving. Manual install: delete the modAutoLoot folder. You can / should remove any custom keybinds from your input.settings file too. Except for the filters, all features of the mod can be changed in the modAutoLoot\Content\Scripts\mod\AutoLoot\AutoLootUserConfig.ws file! return true; // Whether the game will play a sound or not. None for now, mod is feature-complete. Thanks CD Projekt Red for an AWESOME game and the ModKit! Thanks user mcguffin for the item quality and item quantity code!